I have owned my compass since I was about 8 or 9. I would take it with me to Scout camps. Its home was always in the drawer of my desk, a desk and compass that happily moved from Edzell to Turriff and then to various flats in Edinburgh and finally Glasgow. I have had it for nearly 25 years. It was in good nick too but, if truth be told, in all those years I barely ever used it. Joking aside, I was actually very lucky. My camera was also in the bag but hidden away. Although, I discovered later that he also took my headlamp. There are many warnings about theft throughout South America. We have always been very careful and that was our last night bus and long distance journey. Generally, driving styles excluded, buses have been very safe and reliable. I´m just thankful it was nothing majorly important that was nabbed. In reflection, I was suffering from a bout of particularly bad (sulphurous) and frequent (at least every 3 minutes) flatulence throughout the journey. Perhaps that was enough to deter the thief, the vagabond, the ragamuffin, the scallywag, the cad, the villain, the reprobait, the rogue, the rascal. Who knows? We have found that is not always a good idea to look ahead on most buses. In South East Asia they are particularly fond of honking their horns and the buses have a surprising variety of excruciating melodies. In Vietnam they don't travel fast but like to overtake in a way which can be 3 vehicles deep, and that's just on one lane of the road. Just when you feel yourself heading for certain oblivion and an appointment with the Grim Reaper, the bus pulls in, just in time, and calm and order is restored. The worst drivers so far have been those behind the wheels of Eduadorian buses. The driver speeding us from Tena to Lago Agrio had 2 Colin McCrae Rally stickers proudly emblazened across his front windscreen. He didn´t just interpret them literally, they seemed to inspire him into a crazed, primal scream style of driving behind the wheel. He raced other buses, passing them and re-overtaking them in a fierce competition for customers en route, as he silmultaneously swung the bus ruthlessly round tight bends, over blind hills and down steep ascents. In Asia and South America you can buy just about anything in the bus station or on the road. 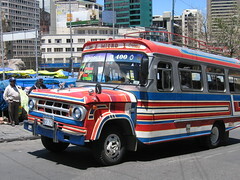 At Quito bus station, for example, all the following was being offered by individuals wandering around: sweets, ice-cream, puppies, fruit salad, TV remote controls, hair dye for men, Rubiks cubes, chocolate bars, DVDs, CDs and spectacles. On the side of the road people sell newspapers, brushes, toilet rolls, drinks and chicken and chips; whilst others camp out beside traffic lights performing juggling tricks and offering to wash your windscreen. Buses can be jam packed within a matter of seconds. Bags of rice or potatoes jostle for space with old ladies sitting in the aisle and small children sitting on laps. And attempts to temper a 7 hour bus ride by reading your book or listening to your ipod are drowned out by music at ear splitting levels or DVDs showcasing violent and bloody martial arts films. What is great about the buses is how much they are used. In these countries most people don´t own a car. Let me travel to London from Aberdeen in the comfort of a Chilean Pullman Bus semi cama (sleeper bus - very comfy!) than a squashed Citystink / Slowcoach any day of the week.